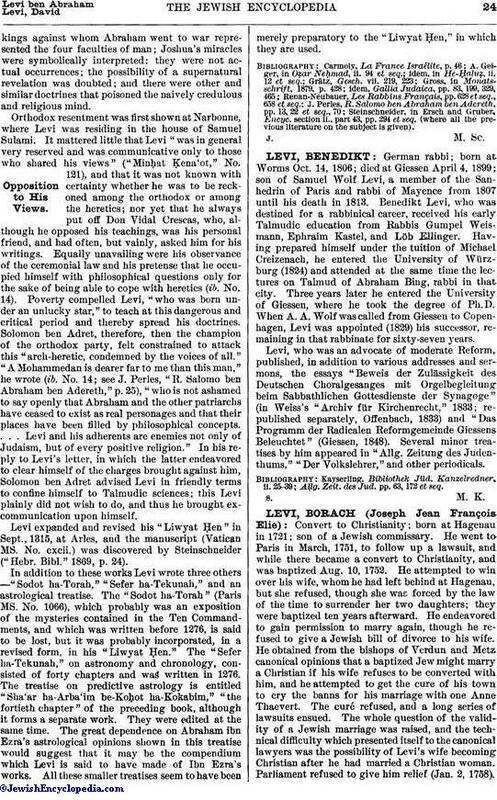 German rabbi; born at Worms Oct. 14, 1806; died at Giessen April 4, 1899; son of Samuel Wolf Levi, a member of the Sanhedrin of Paris and rabbi of Mayence from 1807 until his death in 1813. Benedikt Levi, who was destined for a rabbinical career, received his early Talmudic education from Rabbis Gumpel Weismann, Ephraim Kastel, and Löb Ellinger. Having prepared himself under the tuition of Michael Creizenach, he entered the University of Würzburg (1824) and attended at the same time the lectures on Talmud of Abraham Bing, rabbi in that city. Three years later he entered the University of Giessen, where he took the degree of Ph. D. When A. A. Wolf was called from Giessen to Copenhagen, Levi was appointed (1829) his successor, remaining in that rabbinate for sixty-seven years. Levi, who was an advocate of moderate Reform, published, in addition to various addresses and sermons, the essays "Beweis der Zulässigkeit des Deutschen Choralgesanges mit Orgelbegleitung beim Sabbathlichen Gottesdienste der Synagoge" (in Weiss's "Archiv für Kirchenrecht," 1833; republished separately, Offenbach, 1833) and "Das Programm der Radicalen Reformgemeinde Giessens Beleuchtet" (Giessen, 1848). Several minor treatises by him appeared in "Allg. Zeitung des Judenthums," "Der Volkslehrer," and other periodicals. Allg. Zeit. des Jud. pp. 63, 172 et seq.